As I wrote a few days ago, Paul Coulter is everywhere these days! I’m pulling no punches here, folks. From the above I’ve come away with DC, MT, MS, and SC. Which I recognize to be the USPS abbreviations for District of Columbia, Montana, Mississippi, and South Carolina. I’m going to write a little more in this review and hope for an aha-moment. The U.S. diplomatic corps is headquartered in the District of Columbia. Montana, having a lot of mountains, has a lot of mountain trails to go along with them. Mississippi being the Magnolia State, the MS for it is apt. And South Carolina is known for its Southern cooking (especially Charleston). What do you guys think? Thanks to Vic for stepping in while I was away last week! As my time suggests, this is not a blazingly hard Fireball crossword. It’s a perfectly fine puzzle with a perfectly fine theme, which is nothing special but also nothing terrible. What do these answers have in common? 48a [Buddy of the Clintons, e.g. ], CHOCOLATE LAB. I whipped through the puzzle without paying any attention to the theme, so I had no idea what was going on until I got 58a [People with the most money in poker tournaments…or a hint to 17-,240, 37-, and 48-Across]: CHIP LEADERS. COW CHIP, TORTILLA CHIP, PAINT CHIP, CHOCOLATE CHIP. That’s the theme. It’s fine, as I said; everything works and the four base phrases are solidly in the language. I’ve never heard CHIP LEADERS before and will defer to the commentariat to tell me if that’s really a thing people say. It’s nothing to strain the brain. 1a [Paul Buchman’s wife on “Mad About You”] is JAMIE. I loved this show in large part because my mother loved it so much. “Who did you ignore before you met me?” has become one of our family lines. 1d [Dinero] is JACK, which I didn’t understand until I had all the crossings. Ohh. 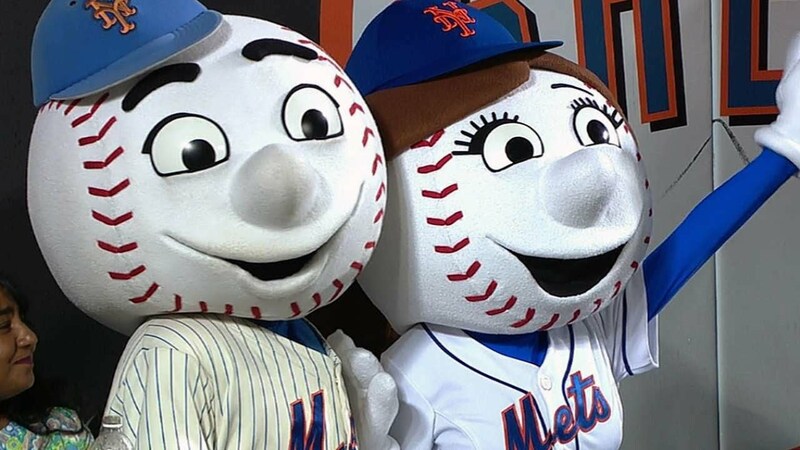 13d [2007 inductee into the Mascot Hall of Fame] is MR MET. I recently learned about Mrs Met, introduced in the 1960s as Lady Met. She took some time off and recently returned to the work force. Original clue for OREO: 31a [They were first made in what is now Manhattan’s Chelsea Market]. 66a [Senior member] is DOYEN. My thought: Huh. We see the female version more often. Google Ngram: WRONG. What I didn’t know before I did this puzzle: that KEN WATANABE lost to Tim Robbins for Best Supporting Actor in 2003. I looked it up to figure out which films they were in and found that Robbins won for “Mystic River,” Watanabe was nominated for “The Last Samurai,” and it was actually the 2004 Oscars. The films were released in 2003; does that make Robbins the 2003 Best Supporting Actor, as the clue says, or the 2004 Supporting Actor? 20a, TAKES TWO TO TAN(GO)[“No one can get in a fight by himself,” informally]. Is it just me, or does this phrase sound weird without “it” at the front? 32a, (GO)ODNIGHT IRENE [Classic song with the lyric “I’ll see you in my dreams”]. 42a, CARMEN SANDIE(GO) [World traveler since 1985]. Now she’s back, on Netflix! 47a, (GO)LF GAME [What’s honed on the range?]. Cute clue! 5d, (GO)LD TEETH [Some expensive dental work]. 13d, (GO)SLINGS [Babies in a pond]. 55d, CHICA(GO) [Second-longest-running Broadway musical ever (after “The Phantom of the Opera”)]. 57d, AGES A(GO) [A very long time back]. An appropriately difficult theme for Thursday, and the execution was okay (barring the weirdness of “IT”-less TAKES TWO TO TAN[GO]). I don’t have too terribly much to say about this one: I liked it just fine! 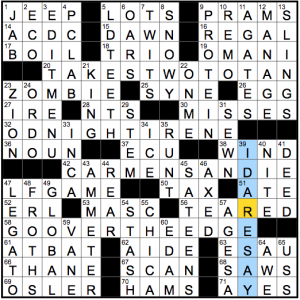 I will say that when a puzzle has nonsense entries due to the theme, I want the fill to be absolutely squeaky clean, and this fill was not: ORDO, NTS, ECU, ERL, OSLER were all unusually rough. Until next time, goodnight Irenes and non-Irenes alike! 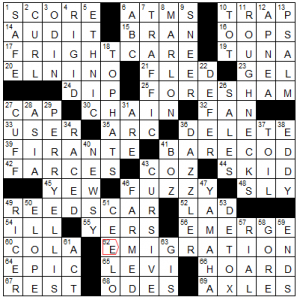 The letter E is moved around in the theme entries due to E-MIGRATION (62a, [Exodus, or a literal feature of this puzzle’s starred answers]). 17a [*Therapy for the phobic?] FRIGHT CARE. Freight car. 39a [*Cost to join a lumberjack poker game?] FIR ANTE. Fire ant. 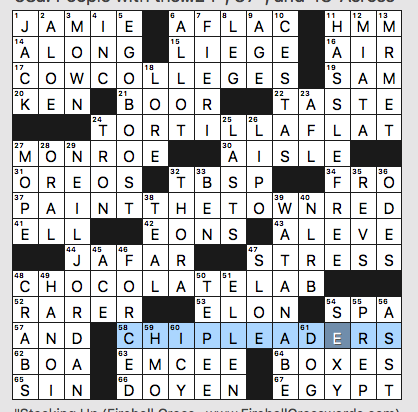 This clue is a little too nonsensical. 41a [*Food fish in the raw?] BARE COD. Barcode. I had a problem with this one. See below. 49a [*Memento of an orchestra melee?] REED SCAR. Red Scare. Two Es but only one of them moves. This is inconsistent with the others which have no extraneous Es. However, I think I like this entry best. It seems plausible and is somewhat humorous. A fairly standard, but enjoyable letter-moving theme. However, my problem mostly had to do with the BARE COD clue. I read “in the raw” as meaning “uncooked” which I don’t think is too much of a stretch. Google tells me it can mean “naked” (with regards to humans), but we’re talking about fish, which is sometimes eaten raw. And since I had _ARE COD, it sure looked like it wanted RARE COD which didn’t make much sense to me as far as the theme went, but it seemed to fit the clue. It didn’t help that the crossing 41d BOZ [Dickens pseudonym] meant absolutely nothing to me (and me an English major!) and further, that in my experience “cousin” is always shortened to “cuz” not COZ (43a, [Ma’s bro’s kid]). So I ended up with RUZ at 41d to go along with RARE COD. A clue which clearly meant “unclothed” would’ve been better, in my opinion, as would one referring to the slightly more modern BOZ Scaggs. As it is, I think that little thorny section is just over the foul line. But beyond that, I’m liking ROUGHNECKS, PERRY ELLIS, TOP HATS, YAMAHA, CURSIVE, EL NIÑO, and DAZZLER [Spectacular event]. Scene from “Return from Witch Mountain.” That’s DAZZLER in the middle. I can’t see that last word without thinking of Disney’s 1978 sci-fi film “Return from Witch Mountain.” I watched it some years ago with my kids because I enjoyed it when I was a kid. Obviously it was very dated and we had fun making fun of it, especially when one of the heroes meets up with a gang of street toughs (other dopey-looking kids) who seek to intimidate her. Can’t find a video, but here’s the actual dialog: “I’m Rocky.” “I’m Muscles.” “I’m Crusher.” Pause for dramatic effect as we meet the leader of the gang… “And I’m DAZZLER.” I want to say this line was even delivered with jazz hands, but I could be wrong about that. It certainly was delivered in all seriousness, and no one blinked an eye at it. Since then it became in inside joke between my kids and me. Anyhoo, I’m not so keen on YERS (55a, [Not our’n]), but it’s better than what I put there initally: YORN. Wrapping up, YMMV but I had a couple sticking points that I feel could have been remedied with some adjusted cluing. 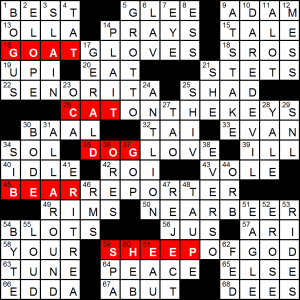 But aside from that, this is an enjoyable grid with good wordplay. 3.7 stars. 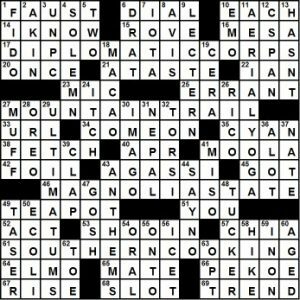 After doing yesterday’s AVCX puzzle, I wondered if “Go-ing Places” would inadvertently have the same gimmick, with GO inserted into some places. That wasn’t the case – let’s figure out what is going on here. AVA Max! I found out about this song through the music blog Stereogum, and it’s made its way onto my regular rotation playlist because it’s kind of a bop. 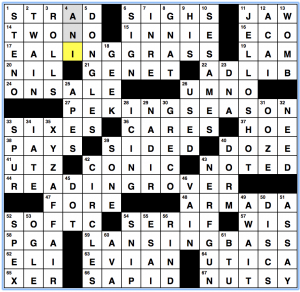 I’ve totally said “UM, NO” before but it’s somehow wrong seeing it in a crossword grid. Fill I did enjoy seeing: CONIC, ARMADA, SERIF, DONGLES, JELLO SHOT, NADIR, XYZ AFFAIR, CIRCLES, and SPEX. This entry was posted in Daily Puzzles and tagged Brendan Emmett Quigley, David Alfred Bywaters, Morton J. Mendelson, Paul Coulter, Peter Gordon. Bookmark the permalink. I still remember the last time NTS appeared in the NYT, because it was stunningly bad. And it still is. NT was a version of Windows—in what context would you ever pluralize it? Completely agree. Would you call other boxes “95s”? Doesn’t help that Microsoft dropped support for NT 15 years ago. Windows NT is a family of operating systems that includes Windows 10. The 32-bit (and then 64-bit) code base that is the meaning of Windows NT is very much alive and has come in many versions. Calling them “NTs” seems ok.
Really? That sounds totally non-English to me. On the Mac side, does “OS Xes” similarly seem okay to you (or just “Xes”)? Because that would be equivalent. I’m guessing neither of those are found “in the wild”. Yeah, it’s not anyones favorite entry, but it’s not totally improbable. For example, from Wikipedia, Concerns were also raised over NT’s memory usage; while most computers of the era shipped with 4 megabytes of RAM, 16 MB was recommended for NTs. I’m not sure about the spelling of plural OSX. “I think even an awkward plural like Unixes (e.g., BSD, Xenix, …) is more likely than a plural like NTs. I’ve never heard anyone say NTs. I laughed when I saw OSLER in the grid. Total gimme for me, but not well-known outside of medicine (and maybe even not outside of internal medicine). Osler is held up as the ideal of humanistic but brilliant medicine. He established the first modern teaching hospital in the US at Johns Hopkins and remains widely quoted. His most famous aphorism is “Seek not to know what disease the patient has but what patient the disease has,” which is variously paraphrased. Universal – South Carolina is certainly southern but I regard shrimp and grits as Lowcountry cooking. Lowcountry cuisine originated with the Gullah (descendants of slaves, or as Ben Carson would say, “Job seeking immigrants”) in the coastal and near coastal regions of South Carolina and Georgia. FWIW I think shrimp and grits is overrated or at the least overexposed. And I do have a high opinion of shrimp. And grits. WSJ: Also in the ′70s was the comic book character Dazzler. Very disco-’70s, though I believe she was rebooted once or twice. Enjoyed the NYT puzzle (with the usual isolated exceptions, here including the unwelcome reminders of Febrrruary weather in 8D:SNOWY and 38A:WIND). The clue for 54D:STASH might have more accurately said that no one else should find it . . . Thanks to Jenni Levy for the background on 69A:OSLER, which makes that name way more interesting than the typical alphabet-soup filler. I suppose the absence of IT from 20A:TAKES_TWO_TO_TANgo is what makes it “informal”. I’m hesitant to call the Universal puzzle’s theme a theme when there are thousands of theme answers and you could make a puzzle with this “theme” by total accident. I think the WSJ clues were fine. I guess my milage varied.